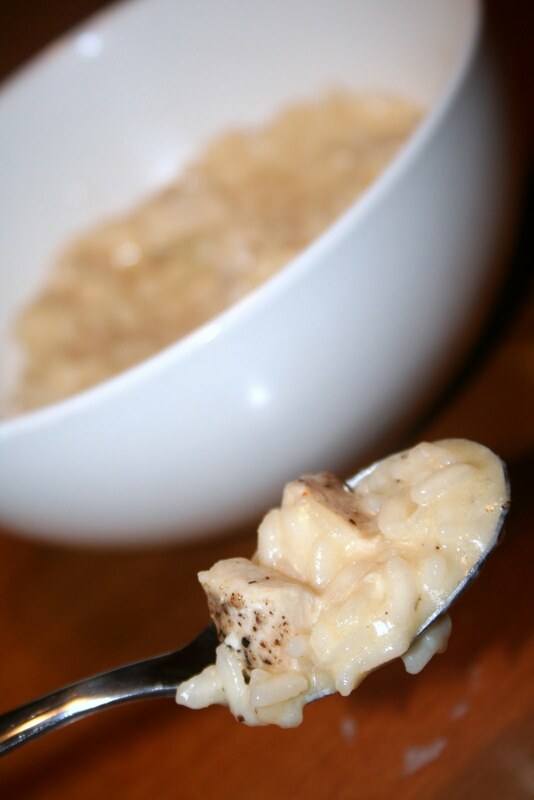 Risotto is a dish that many people are intimidated to make on their own, and I admit I used to be one of those many people. I do love Risotto though, but rarely get it when I go out because there's usually something about the recipe that I know I won't like (lots of mushrooms, shrimp, etc...) so I don't even bother. Since I love it I was inclined to try my hand at it, fully prepared to fail. I know, talk about a fantastic attitude, right?! (said in a sarcastic voice). Well, ye a little faith! The first time I made it, I was hooked on homemade Risotto and knew I'd never be afraid of it again. 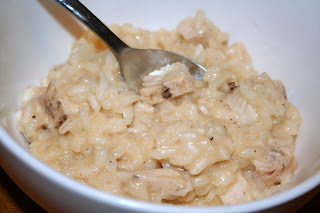 I have many Risotto recipes that I want to try, but I see Risotto as more of a "have every once in awhile" kind of dish. It's easy enough to make all the time but I'm afraid it'll lose it's appeal. Not sure why, but hey - it gives me something to look forward too, right?! In a medium saucepan, bring the chicken broth to a boil, reduce heat and simmer. In a large skillet, melt butter over medium heat. Add the shallot and cook until tender, about 2-3 minutes. Toss the garlic in with the onion about 1 minute in to the cooking to so it doesn't burn. Add the rice and stir to coat in the butter. Continue roasting the rice, stirring constantly, about 2 minutes. Add champagne and simmer until most of the liquid evaporates, about 2 minutes. Add 1/2 cup of the broth and stir until almost completely absorbed by the rice, about 2 minutes. Continue cooking the rice, adding broth 1/2 cup at a time, stirring constantly and allowing each addition of broth to absorb before adding the next, until the rice is tender but still al dente (firm to the bite). About 20 minutes total. Remove from heat. Gently stir in heavy cream, cooked chicken, Parmesan and S & P to taste. Jennifer - its hard to say, because everyones version of a serving is different. There's only two of us in our house and based on how much we eat, and the fact that this is usually the only dish I serve when I make it, it makes 3 full-meal servings. If you were to pair with a side dish of some sort it would probably be great for 4 main course servings. If it were the side dish I'd say 6-8 side servings. Hope you enjoy it!